Something ought to be done about the ignorant adults who sneeze in your face in a public or private settings. Even children know better! 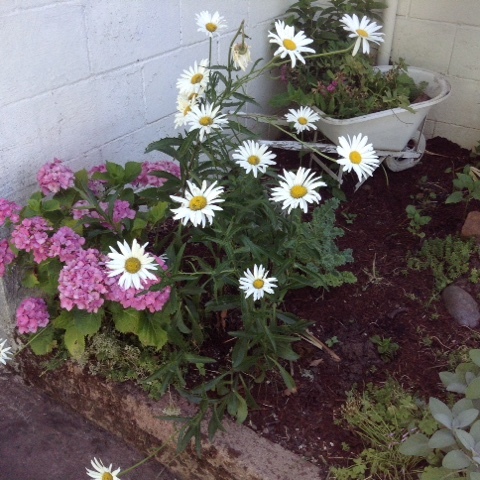 I got a summer cough that Is only now subsiding but have been going ahead with my garden and house. Someone walked past me in a grocery store and that was that. There must be something each person who has been sneezed on can do or say to correct this national health threat. I have been unable to talk much on phone or use Skype because of this cough so it put me quite out of circulation...no tea with friends for awhile and no making videos til this subsides. Before I got this cough, a friend came to visit and oh, how I loved just having her and her grown children making the normal noise of a home with talking, laughing, music, footsteps on the wood floor, food preparation, helping with things, fixing things, napping in chairs, reading and talking about everything interesting . We were so content at home I forgot to take them several places I had planned. My friend gave me a big bag of herbal tea made from calendula, uva ursi, juniper berry and other things. The picture above is just the way I make a cup of tea from the huge bag of fragrant herbs. By the way the tea makes me feel great. When the lawn gets greener I will post a whole picture of the house, after I get the porch swept and cleaned up. Outdoor work is like having another house to take care of! 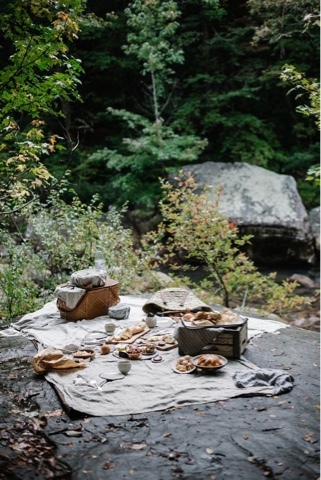 For those of you who do not have access to Pinterest, I have collected these pictures of the way people are using their own yards for "outings" and hospitality, even for just themselves. You may remember my sheet tents a few years ago, and how the trolls where mocking them to derision. 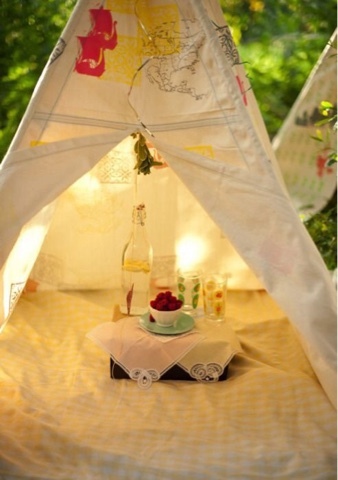 Well it wasn't long before there were similar things all over the web, and Pinterest had plenty of glamorous back yard sheet tents! 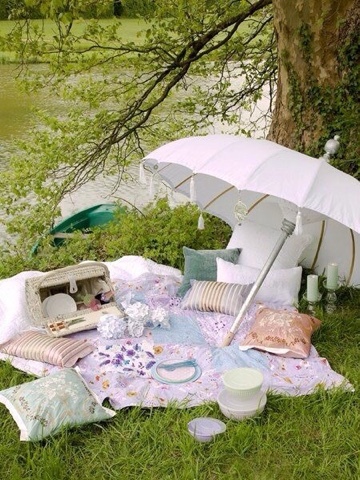 This one is from Pinterest but I do plan to make my own sheet tent area again soon! The following pictures are from Pinterest. ....like this, below, which I have seen in garden shops, are quite expensive. 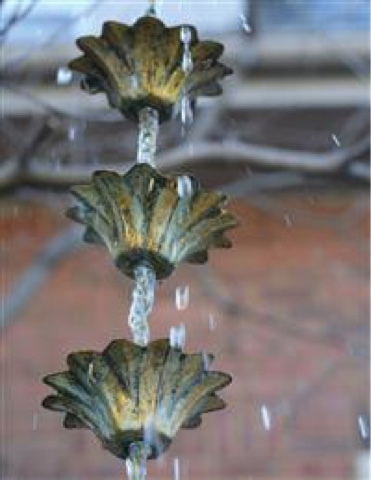 If you do a rain chain search, you can see some quite elaborate versions that look like little umbrellas and my how lovely it would be to have one outside the bedroom window or living room window. Some are over $70! 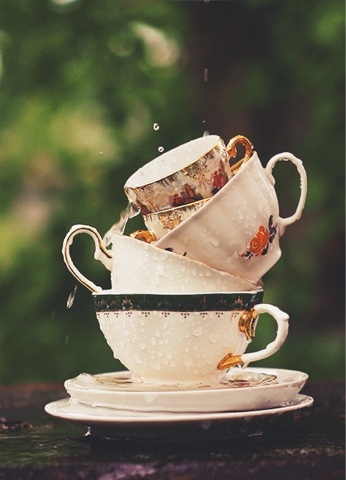 These stacked teacups make a nice waterfall with no drilling or chains or work at all. I used to take all my beat up useless tea cups to donate at thrift shops but now I will keep them and make a stack of my own in the garden. 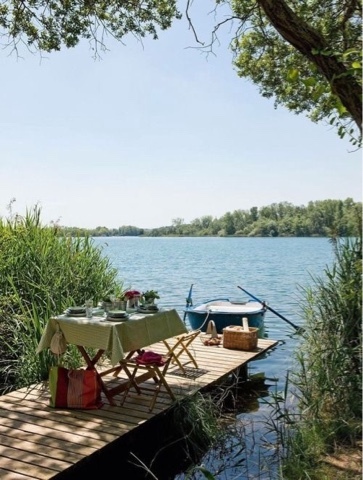 This is an animated gif from Pinterest but when I went back to the site I could not find the link. Maybe you can find it and watch the rain fall in the cups. I will tell you one more story. It will never become a novel or a movie but it is free to you, and will give you something nice to think on today. My friend from England who came to tea when I had a tea room, introduced me to her husband who was a gardener, caterer and worked at other things. "I got tired of meeting the charmer and the social climber, or the man who wanted to make a million dollars, and was thrilled with someone who cared about the home and the house. "On his days off work, what does he like to do? Mow the lawn, fix things--always looking around for something to repair, improve, paint or re-do.
" On weekends he takes the family on a car trip just for a few hours, somewhere for scenery.
" Some people don't think that is very interesting but it is very comforting to me knowing he will be there for us and make the house a safe place to live in. For me, it can't get more loving or interesting than this!" I loved your sheet tents. I'm sorry to hear you've been under the weather, and hope you're on the mend and soon fully recovered. Summer colds are the worst, I think. At least in the winter, you have an excuse to burrow into a quilt and shut out the world for awhile. 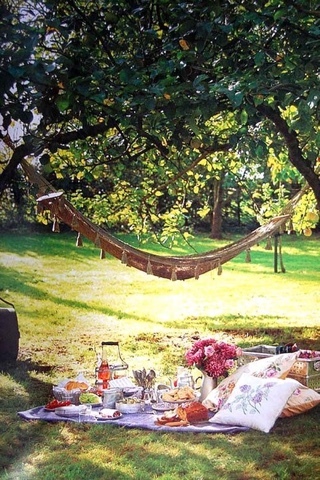 In the summer, for reasons you've mentioned, such as so much work outdoors. The photos of your garden are lovely, and I look forward to seeing more when you are able. I agree with the poster above, summer colds are the worst. I took my Mom to get her shot in the eye this morning and the office was so cold. She was wearing a tee shirt under her blouse and still was shivering. I was in a sleeveless top and thanks to my never ending hot flash, was comfortable. When we came out to the car, it was boiling and humid. She lives close to the coast so she's got a never ending breeze and her house when we cracked the windows and the back door screen, was tolerable. Your impatiens are so lovely. 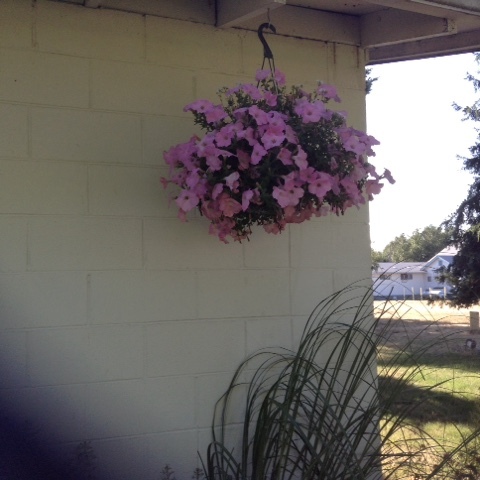 I'm going to have to replant my hanging basket with something that is wind tolerant. The wind tunnel we have in our front patio decimated my petunias, and they were so pretty. Guess I'll have to ask at OSH what would do best? My husband's aloe vera, on the other hand, has escaped the coconut husk planter and is going wild. I hope you feel better soon. Add some lemon tea with honey in the mix, that'll help your cough. Summer colds are no fun. I hope you are over the worst of it. I remember you posts on your sheet tents in the yard. I thought it was so charming and romantic. In fact, it's still one of my favorite things on your blog. Oh Lydia, I am so sorry you have a summer cold. It is awful when you have so much you want to do and are not feeling well. Hope the cold remedies make you feel better soon. Will be praying for you. 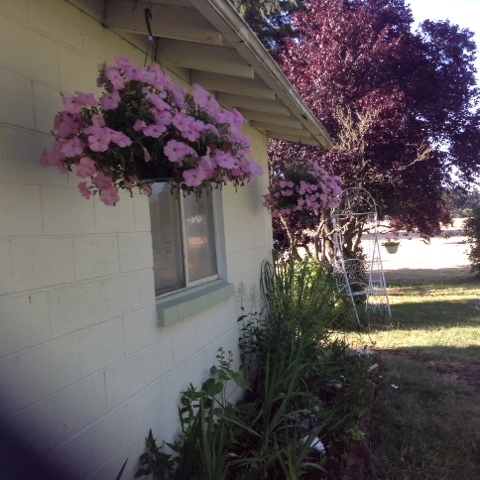 I love your pretty hanging petunias and your lovely flowerbed. Daisies are so refreshing. For the lady who wants some showy flowers that are wind resistant, Million Bells come in a variety of colors and are hung over our town, the river and bridge coming into town. They do really well in the wind tunnel. 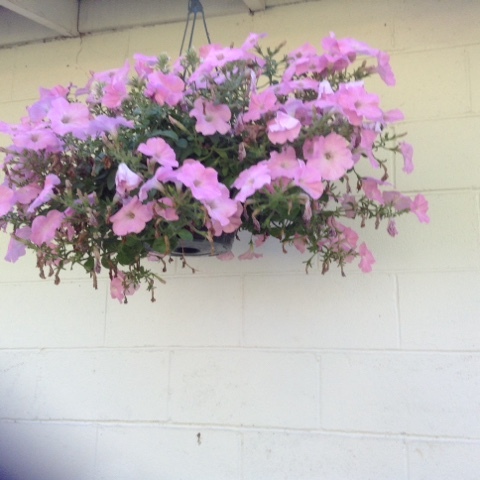 They resemble petunias but are much smaller and very showy. I like the idea of rain chains and have seen several of them. You are right they do have lovely soothing sounds. Thank you for sharing. your English friend has a wonderful husband! Sorry to hear you have been unwell Lydia - I hope you are feeling better soon. I must have missed your post about sheet tents - what a wonderful idea! 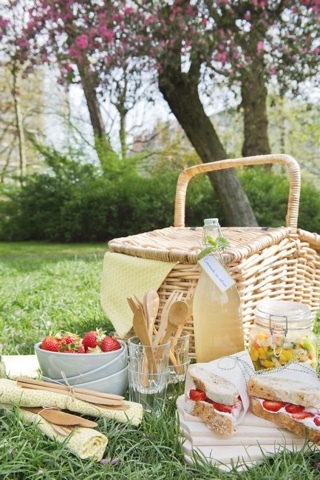 I love your collection of images of sunny picnics - we have to enjoy this weather while it lasts, although I do find the very humid weather tiring. It's forecast to be 29 degrees today in the U.K., which is really hot for us & we're not used to it! I like the story about your English friend's husband - one of the most attractive qualities in a man is kindness and he sounds just that! You have been vindicated with the pro sheet tents! People here use their elbows in which to sneeze....we here are very good about doing that...I wish those where you live were! My poor husband has had a terrible cough now for sixteen months. Yes, he has been medically treated, but the cough persists. But as you said, he is very kind, and a nice drive out is something we both enjoy. 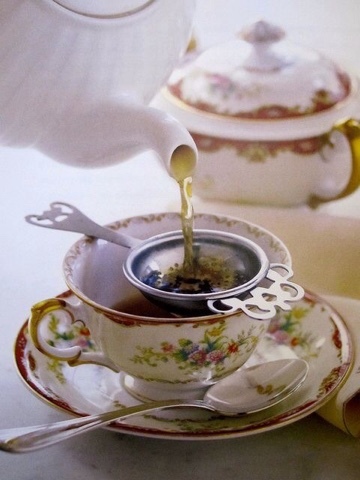 I love pretty tea cups! 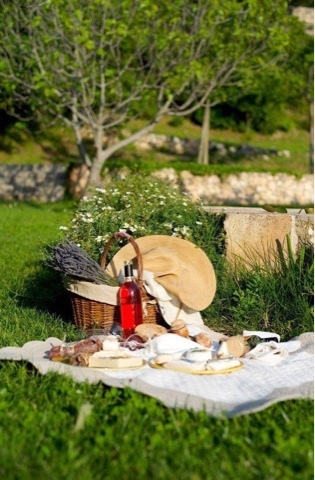 The photos of picnics are so delightful Lydia. So uplifting. My great-grandchildren and I often have a picnic outdoors under a shade tree while the weather is nice. 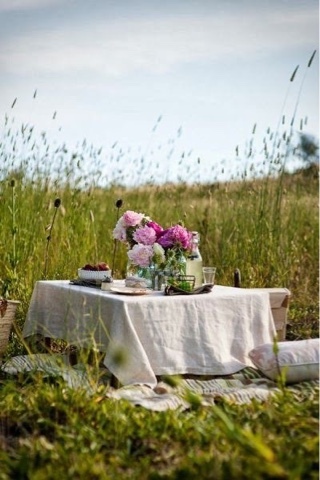 We take notice of the plants growing in the grass, bugs, birds and their songs and the sound of the wind in the trees. When the creek is low it makes a soothing trickle sound they notice also. When the weather is cold and rainy we picnic indoors in front of the tv and watch a movie or sing songs. I make a big deal out of it and they eat better when they can keep helping themselves to the goodies. Thank you for sharing, Hope ou feel better soon.